It’s a poor fit, so much so it’s unwearable. Tightness is perfect, but it is way too short. I’m only slightly above average height. 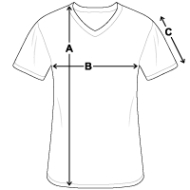 Only problem during design was that it hasn't allow to change from v-neckt shirt to rounded one with saving the design. So I stayed with v- neck, otherwise everything perfect.